Situated in one of Southborough's most popular locations is this highly desirable family home which is presented in immaculate condition with the current owners having worked hard to bring a modern touch to a traditional feeling home retaining period features such as fireplaces and original stripped doors. The entrance hall is light & bright providing a welcome entrance. There is a very grown up sitting room with a beautiful bay window and open fireplace as well as a further reception room at the back of the house currently used as a family room but could also be used as a playroom or formal dining room. The kitchen/ dining room is at the heart of the house and with plenty of storage and fantastic cooking facilities this is where the family will spend a lot of their time. Upstairs there are three double bedrooms with the master bedroom having a large bank of built in wardrobes providing extensive storage space. The family bathroom has been well thought out and has a large freestanding bath as well as a modern double walk in shower. Externally there is a large garden with plenty of playing space and entertaining space for grown ups. 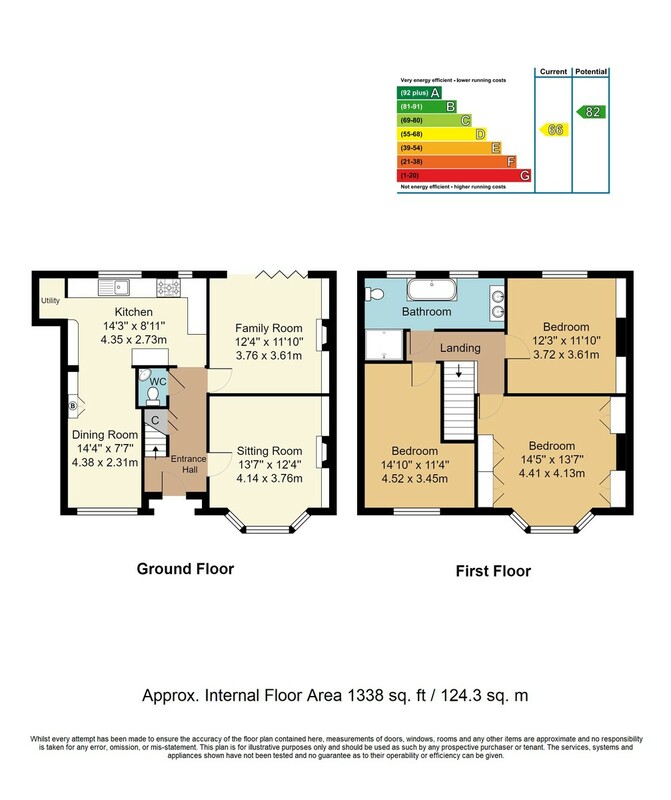 There is a potential for a loft conversion and possible extension to the rear if desire (SSTP). We highly recommend a viewing to appreciate the quality of this home. ENTRANCE HALL: Stairs rising to first floor, understairs cupboards with power. CLOAKROOM; Understairs with basin, WC, tiled walls and floor. FAMILY ROOM: Double glazed bi-fold doors opening onto garden, log burner, cupboards to either side of chimney with shelving, engineered hard wood floor, ceiling spotlights. LIVING ROOM: Double glazed bay window to front, open fireplace with cupboards to either side of chimney with shelving above, engineered hard wood floor, ceiling spotlights. KITCHEN: Fitted with a range of wall and base cupboards and drawers with a quartz worksurface fitted over, inset sink unit with extendable mixer tap and drainer, eye-level double oven with microwave and warming/ proving drawer below, 5-ring gas hob with Stoves extractor hood above, tiled splashback, integrated dishwasher, integrated fridge/freezer, two double glazed windows to rear, breakfast bar, tiled floor, large separate space housing washing machine and tumble dryer. DINING AREA: Converted from the garage; double glazed window to front, radiator, ceiling spotlights, cupboard housing gas combination boiler, engineered hard wood floor. LANDING: Ceiling spotlights, loft hatch (potential to convert). BEDROOM: Double glazed window to front, range of built in wardrobes providing hanging and shelving space, ceiling spotlights, radiator. BEDROOM: Double glazed window to rear, radiator, ceiling spotlights. BEDROOM: Double glazed window to front, radiator, ceiling spotlights. BATHROOM: Freestanding bath tub with central thermostatic controls and filler, twin sinks set onto vanity unit with drawers below and monobloc mixer taps, WC, walk in double shower cubicle with thermostatic controls and waterfall shower head, tiled walls, tiled floor, two heated towel rails, two double glazed windows to rear, extractor, ceiling spotlights. OUTSIDE: FRONT: The property has a driveway providing parking for one car. A gently inclining path leads you to the double glazed front door with a planted area to the right hand side having seasonal flowers and shrubs. A climbing wisteria winds over the front door. REAR: There is a large patio area leading immediately from the family room opening onto a good expanse of lawn with flower beds and border, mature shrubs, decked area with summer house and shed. Gated side access, outside tap. SITUATION: Doric Avenue is located within the heart of Southborough village with its local shops and amenities. It is conveniently located for access to three mainline stations at Tunbridge Wells, High Brooms and Tonbridge, all offering fast and frequent rail services to London & the South Coast. Access to the A21 is within 3 miles which connects to the M25 London orbital motorway. The main town of Tunbridge Wells is 2.5 miles away where you will find the Royal Victoria Shopping Mall, Calverley Road Precinct, the old High Street and The Pantiles with its selection of independent retailers. The Spa town has a wide selection of cafes, bars and restaurants along with two theatres, a cinema, a sports centre and a good selection of recreational facilities including, golf, cricket and rugby clubs. The area offers a wide choice of well regarded primary and secondary schools including a number of grammar and independent schools for both girls and boys, many within walking distance of Wellington Gardens.